Unlimited music, ad-free, across all devices. TIDAL is a global music and music video streaming service built for fans, directly from artists around the world. With a catalog of more than 50 million songs and 200,000 high-quality videos, TIDAL offers its members a complete music experience and allow fans to establish a closer connection with their favorite artists. The service offers high-fidelity, CD sound quality music, offline listening, curated editorial content, exclusives and more. This gift card may be used to start a new TIDAL subscription account or make a payment on an existing account. This card is not valid for use in the TIDAL store and may only be applied toward monthly subscription fees for the TIDAL streaming service. 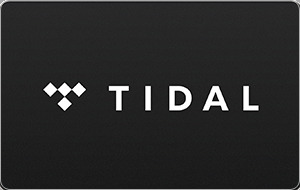 Internet access and compatible hardware are required to access and use TIDAL. For more info visit: http://TIDAL.com/US/TRY-NOW. You must be 18 years of age or older or have permission from a parent or guardian to sign up. The TIDAL service is not intended for children under 13 years of age. Use of the TIDAL service is subject to TIDAL’s terms and conditions of use, which can be viewed at http://TIDAL.com/US/TERMS. This card is not redeemable for cash and cannot be returned for a refund once redeemed. Unused balances are non-transferrable and non-refundable. Balances on multiple cards cannot be combined into a coupon or other cards. This card cannot be used in connection with any integrated third-party billing. This card does not expire and no fees will be assessed against the amount of this card. TIDAL is not responsible for lost, damaged, destroyed, or stolen cards. Except where prohibited by law, your sole remedy in any event shall be replacement of a defective card. Void where restricted. Nothing above shall restrict any rights you may have under applicable law.